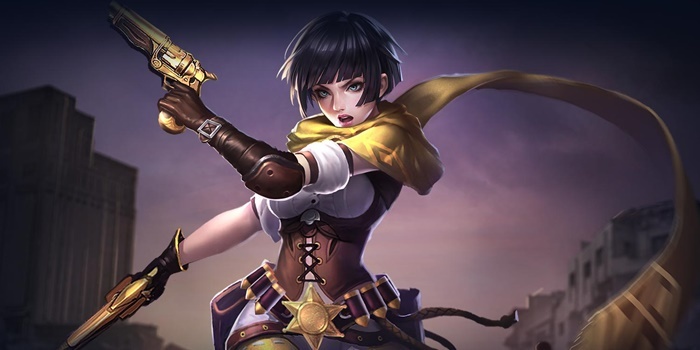 Guide for the hero Violet, a character in Arena of Valor (AoV). Included are Violet’s abilities, statistics, attributes, strengths, weaknesses, and more. These are Violet’s attributes on the mobile version of Arena of Valor. Click here for her attributes on the Nintendo Switch version. Normal attacks reduce Tactical Fire’s cooldown by 0.5 seconds when hitting an enemy hero. Violet rolls forward, enhances her next normal attack and deals 275/305/335/365/395/425 (+1.0 AD) ˀ physical damage to enemies on a straight line. The subsequent normal attack within a short period of time retains the range of the enhanced normal attack. Tactical Fire also grants a 50% movement speed bonus that declines over 2 seconds if there are enemy heroes nearby after rolling. Can hit multiple enemies in a single line. Can pass through certain walls while rolling. Critical damage is only applied to Violet’s base AD. For example, a normal (200% damage) critical hit on a level 1 Tactical Fire will deal 2AD + .15AD + 275 damage. Violet throws a grenade, dealing 250/280/310/340/370/400 (+1.0 AD) physical damage to enemies within range and slowing their movement speed by 90% for 1 second. Cannot slow down epic creatures. Violet fires Concussive Rounds at nearby enemies, dealing 400/550/700 (+1.5 AD) physical damage. Can hit multiple enemies on impact. Violet’s passive reduces Tactical Fire’s cooldown quickly. Use frequent normal attacks in conjuction with Tactical Fire to harass the enemy. To finish enemies quickly, use Fire in the Hole to slow enemies down, then follow-up with Tactical Fire or Concussive Rounds. Our recommended order for Violet abilities as she levels up. See all of Violet’s item builds.